Refer all questions to (781) 245-2122; Fax via (781) 245-2492; E-Mall via jbertagna@comcast.net. Contact Joe Bertagna at jbertagna@comcast.net with any questions about our camps or other instruction. The staff of Bertagna Goaltending can visit your youth organization. 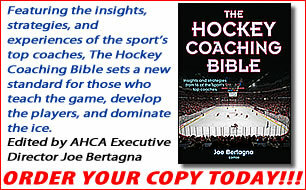 If your organization is interested in Joe's services, contact Joe at jbertagna@comcast.net.